Where the waters run brown, can’t see the anchor go down. You just gotta believe “it’s better in any Bahamas town”!! 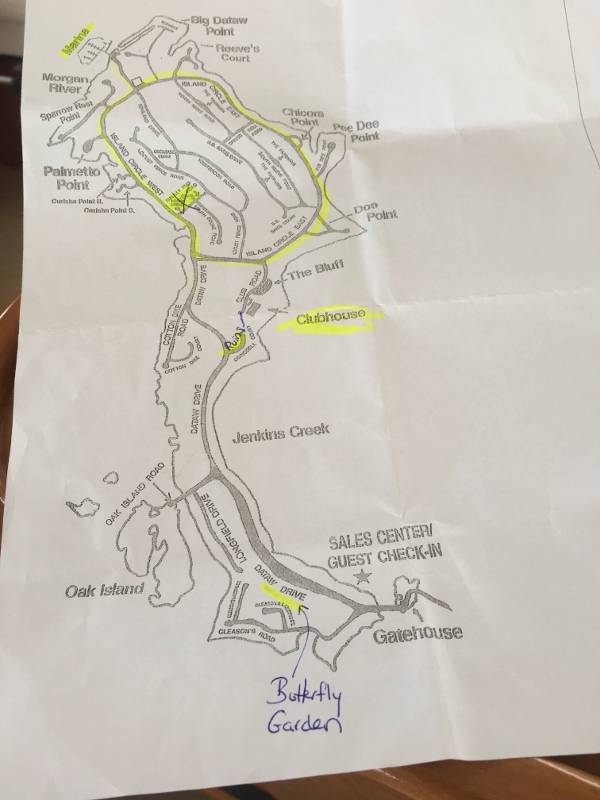 I know you are so curious to get the lowdown on our crossing. On a scale of 1 to 7 with 7 being SUPER Excellent, I’d rate this one a 4 ½ . The first part across the banks was fine and we moved right along at 12- 13 kts. The plan was to get about 8-15 miles past the banks (into that deep dark Atlantic abyss), then slow down. Had to time our arrival at Ft Pierce inlet for close to 7:30pm slack. Before that, the current would be ebbing out. The ocean currents run across the channel, and if the winds are out of the SE AND an ebb tide, the entrance is rough. Forget that. We departed out of Ft Pierce a couple of years ago in the wrong conditions and that was a lesson learned. I offer this VHF conversation as proof we were smart to wait. S/v Elan to s/v Sam the Skull: “What’s your ETA? We did the inlet at 5pm and it was horrendous (well yes, they nailed maximum ebb).” The reply; “ETA is 7:30.” This guy knows his stuff, he’s also from Glasgow Scotland and the accent is enthralling. We came in at 7pm with no difficulty. Yes, I prepped for worse; my favorite magic trick. As has become SOP we stopped at Melbourne Beach, anchoring off the long fishing pier that has two lower side docks for dinghies. 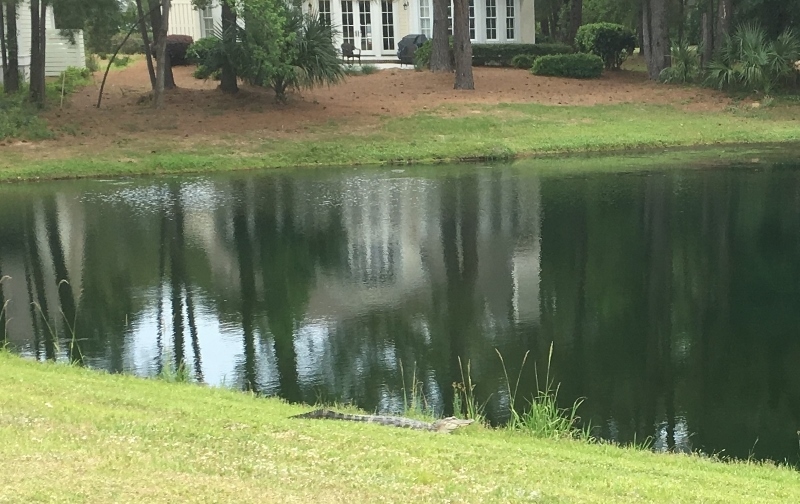 Florida is great that way; so much fantastic water access. 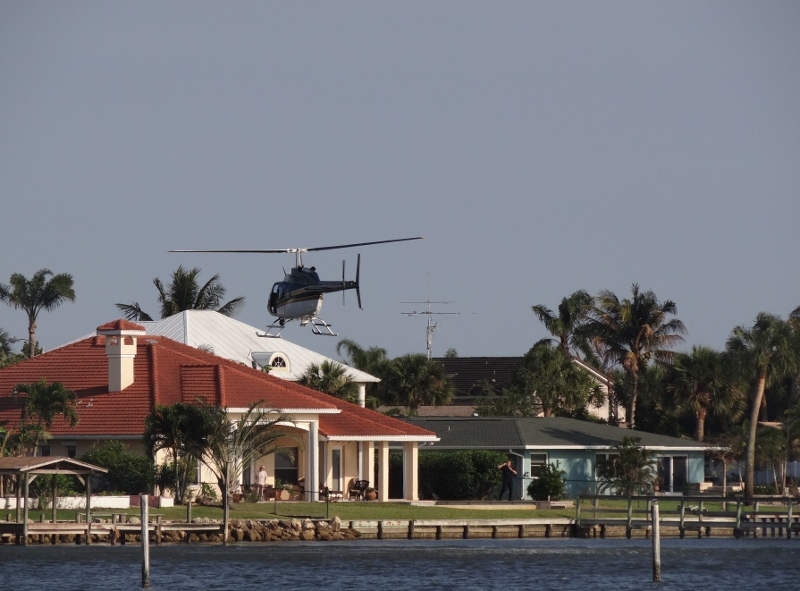 A low flying Sheriff chopper got our attention with his continuous swooping down and in maneuvers. What or who was he looking for? Listening to local radio next morning heard it was a wanted someone. You can see how very low he is. And then it happened; I knew the day would come. Extra worrisome in a power boat, but even worse in a power boat with only one engine; we have two. The starboard engine oil pressure gauge showed a very high reading after we’d been underway at 12kts for just a short time. Twin Sisters has two helms, one in the main cabin and one on the flybridge. We like to use the flybridge as it offers great visibility. However, the flybridge helm does not have the oil temp and pressure gauges so my job is to check on them. Uh oh. Russ was surprised that the gauge read high, rather than low which is the typical problem. Keeping the rpms to less than 2400 kept the gauge happy and Russ researched the issue while I ran the boat. Anchored close in for the day. I took this photo from the boardwalk. We stopped to anchor close in at Cocoa Village and while I shopped Russ tried to find the pressure valve, with no luck. The most likely problem was an easy one; the sender busted and sending bad data to the gauge making us THINK the pressure was too high. 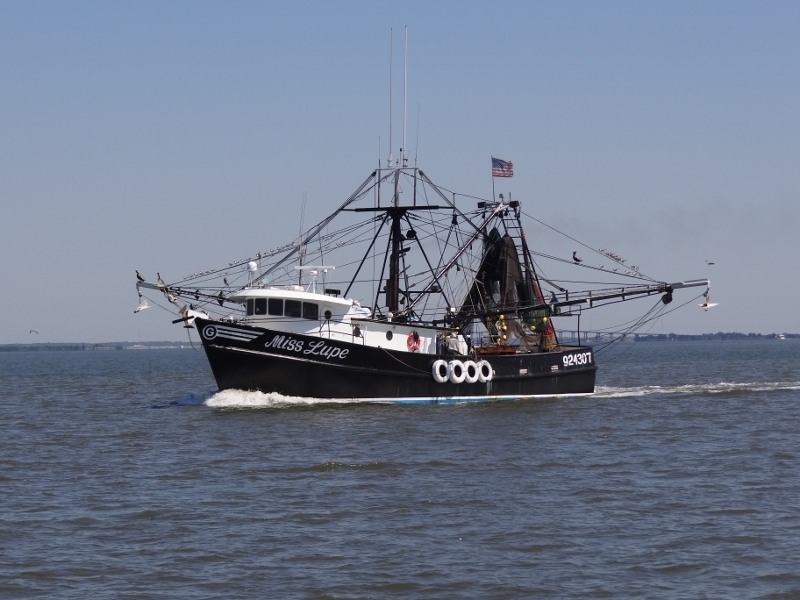 But two other causes would mean more serious trouble so to be safe we booked a slip at Camachee Cove Marina in St Augustine where they have on site engine mechanics, and kept our speed down to 8kts and 2000 rpms. Boy that seems slow now, when with Ms Ortolan we’d seldom exceed 7kts unless we pushed or were sailing. 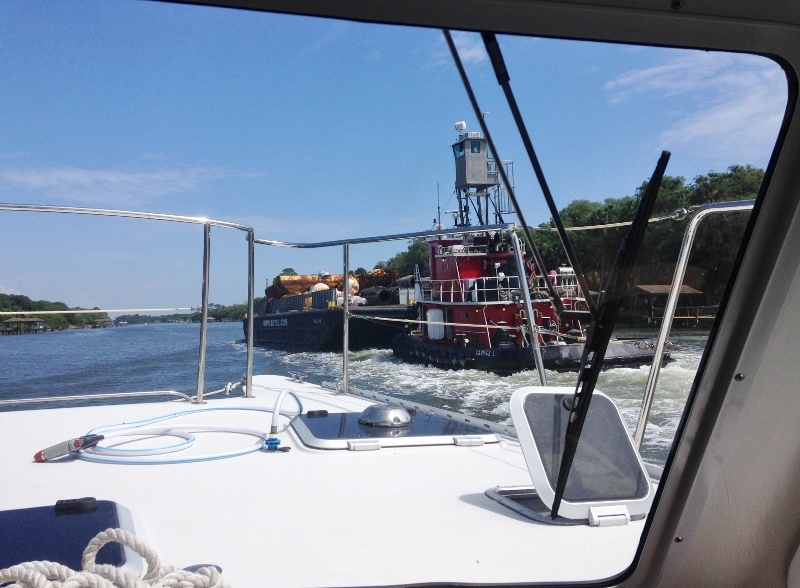 Took mostly port engine power to pass this guy who would not slow down- gotta keep to that schedule! 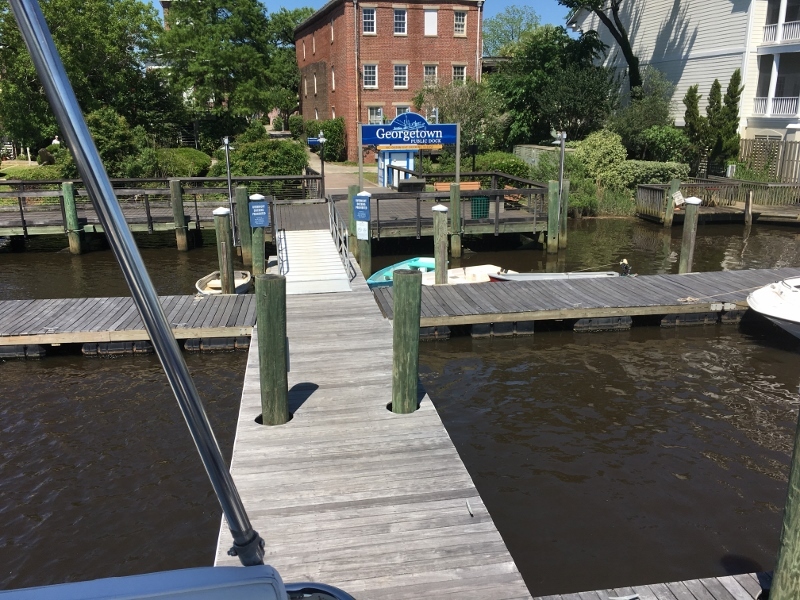 A few nights at a dock with power, water and all the other marina amenities would be just what we needed. Twins needed a good wash-down, I needed some “no worries” time and with rain and T-storms arriving in a few days, this was perfect timing. Plus, we met PDQ34 Traveller, who’d be heading north for the PDQ Georgian Bay rally. 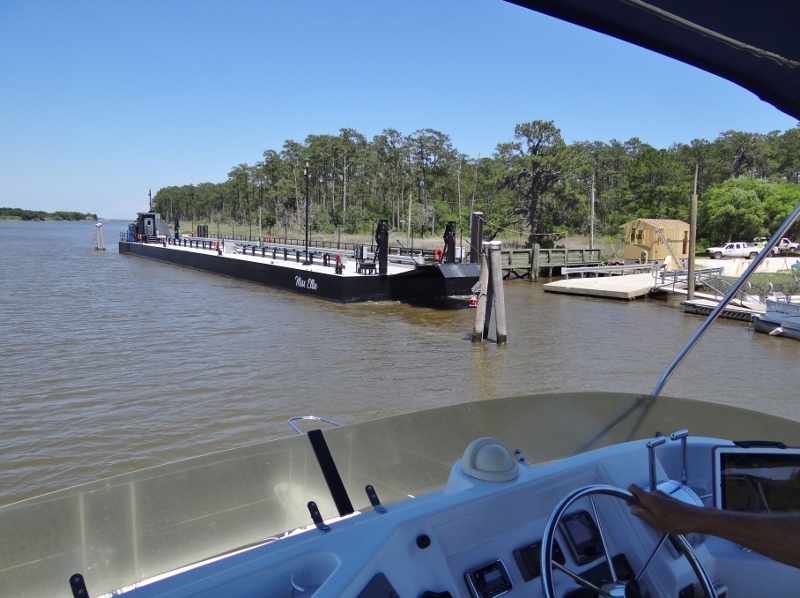 Competent and friendly marina staff, floating docks with good power, wi-fi, large boaters’ lounge with book exchange (Russ met sv Voyageur– heading up to CT) and newer front-loader washers and dryers. What’s not to like? We delayed our departure one day for a good reason; to celebrate our May 5 anniversary with dinner out at Collage in downtown St Augustine. Only a $6 uber ride away; we went in early to shop and walk around. Next stop- Georgia. Heading north at this time of year (later than we ever have) we are definitely at the tail end of the snow bird pack. I like it: fewer boats to pass or be passed by and no problems getting a spot at any marina on very short notice. 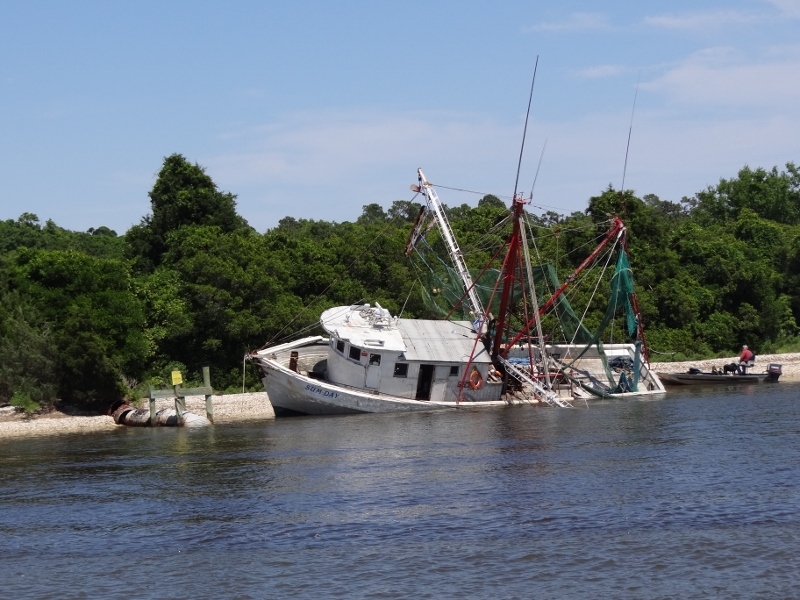 But what we have seen, mostly in South Carolina, is plenty of shrimpers heading back to unload their fresh catch, but also in SC and NC several derelict fishing vessels- more than we’ve ever see along the ICW. What’s up with that? The local tourist boats are out in force now and only the bravest cruiser dares travel certain ICW stretches on busy weekends- oh wait we did that; more on it later. 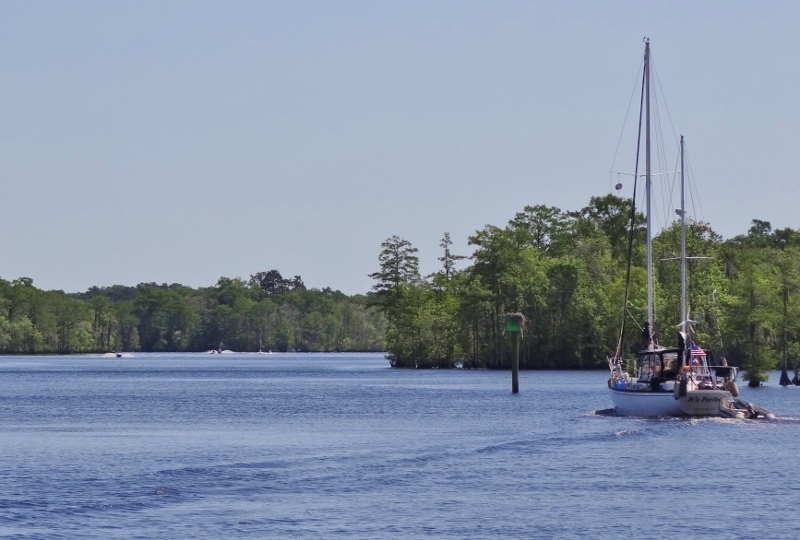 A place we’d read about, but never saw due to it not being right on the waterway, is Dataw Island Marina. 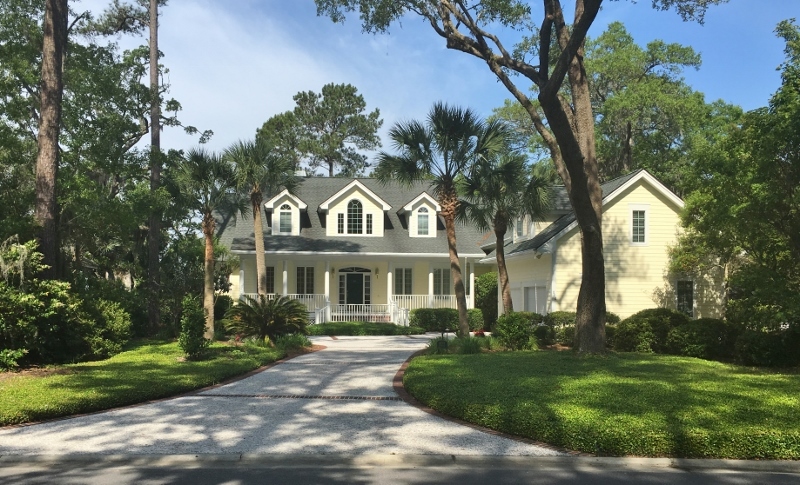 It’s near St Helena Island, about 15 miles north of Beaufort, SC and you need to go about 3 miles off the ICW but it’s a marked and easy detour. With a long face dock, they could accommodate a major PDQ rally, not just little ole us and one sailboat. What’s the attraction? 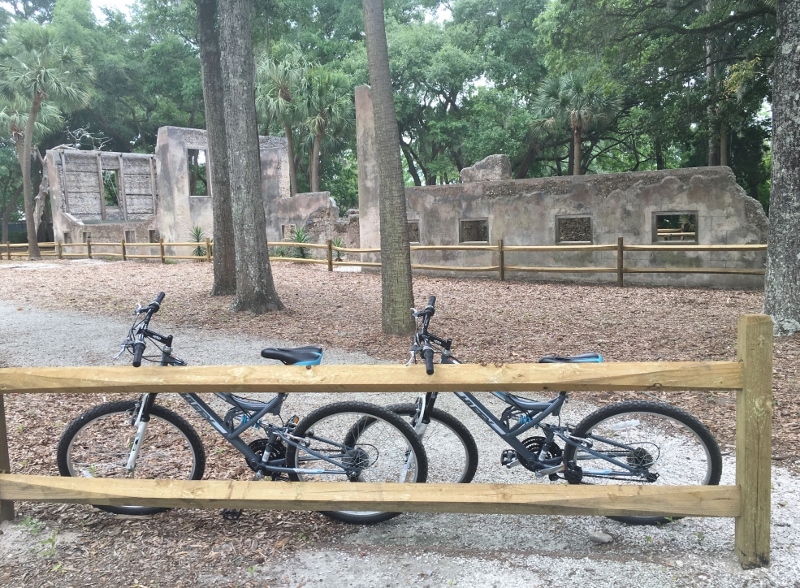 How about: easy docking, excellent restaurant, Sweetgrass, at the head of the docks, loaner bikes so you can explore the tiny island and marvel at the award-winning golf courses (two scattered throughout the entire island), admire the butterfly garden and if given the correct directions, visit the plantation ruins. All doable in less than 3 hours, unless you want to keep biking around. 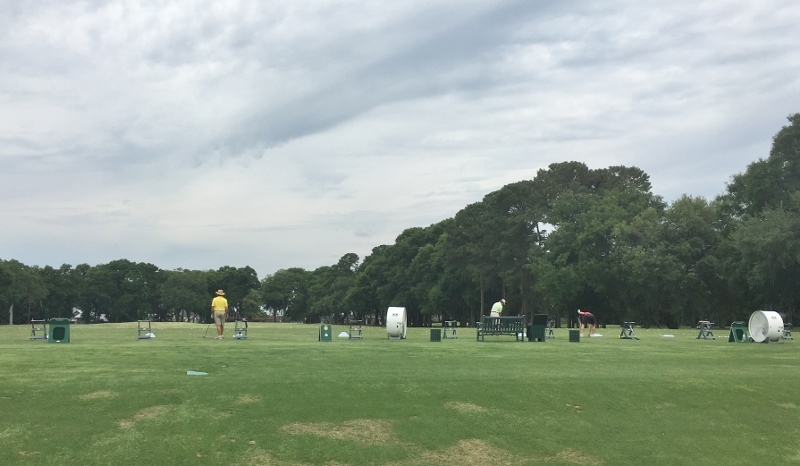 Luxury golfing. Everyone we met and spoke with was very friendly- southern charm. The flat island was easy biking- no gear changing needed. Yep, just my style. The kitchen would be separate of course. Darn hot cooking and baking except in winter I guess. Dinner, service and ambience at Sweetgrass were so enjoyable that one night wasn’t enough so we returned the next. You can get lunch, coffee and smoothies at The Outpost also at the marina where the same kitchen services both. 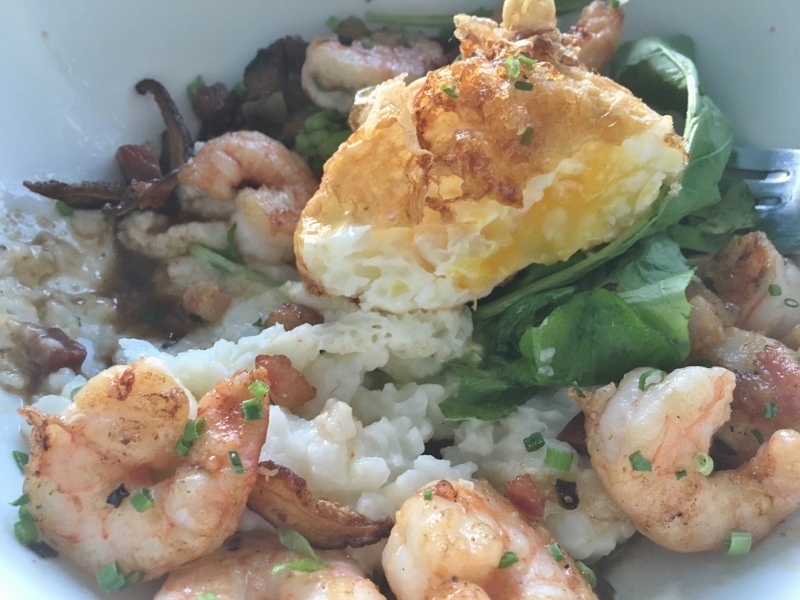 Gourmet shrimp and grits with bacon pieces and mushroom slivers. topped off by a deep-fried egg! 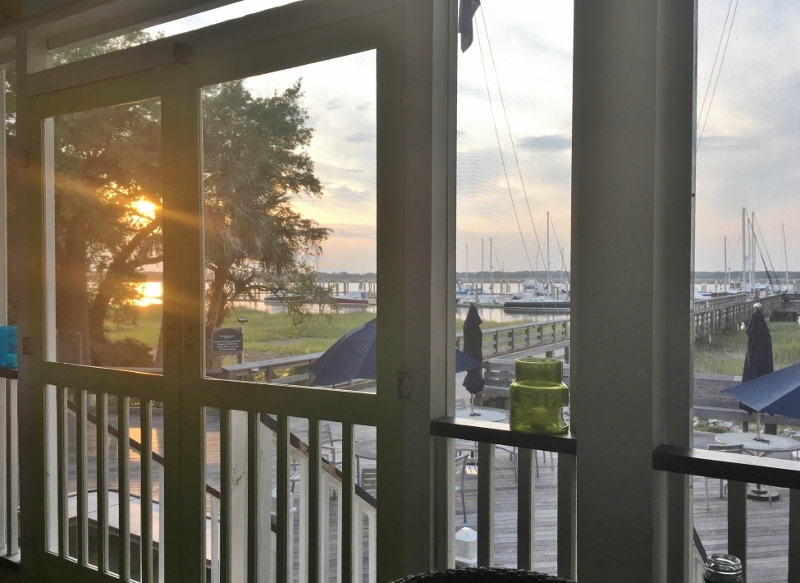 We don’t make a habit of marina hopping but right after Dataw Island would be Charleston and how could we pass that up? 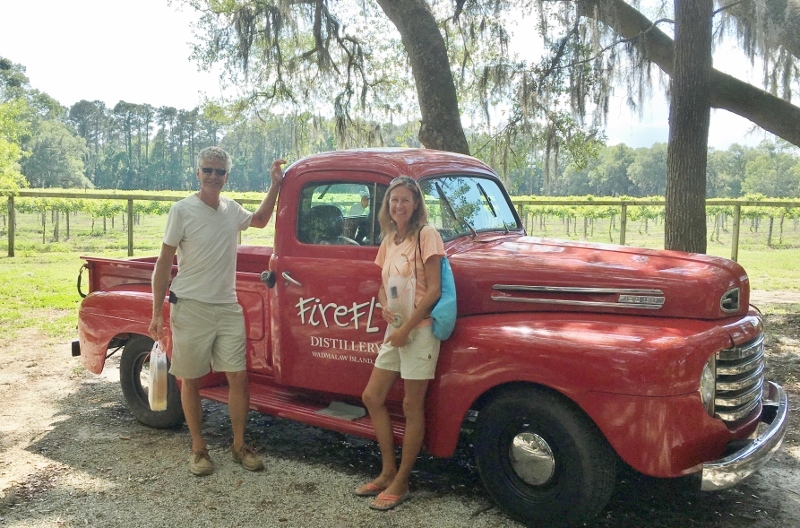 More to the point how could we pass up Firefly Distillery?? Thinking about it, Firefly may be the first distillery we ever visited (two years ago) and we’ve been finding more ever since. Posing with our distillery purchases. The nice couple we met at the tasting bar took our picture. Spending time in Charleston is fraught with decisions. 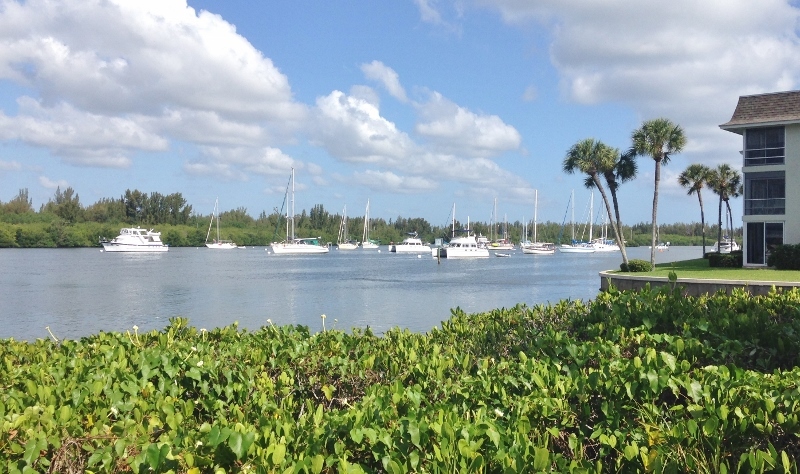 Several marinas offer easier and more available docking but aren’t close to downtown. 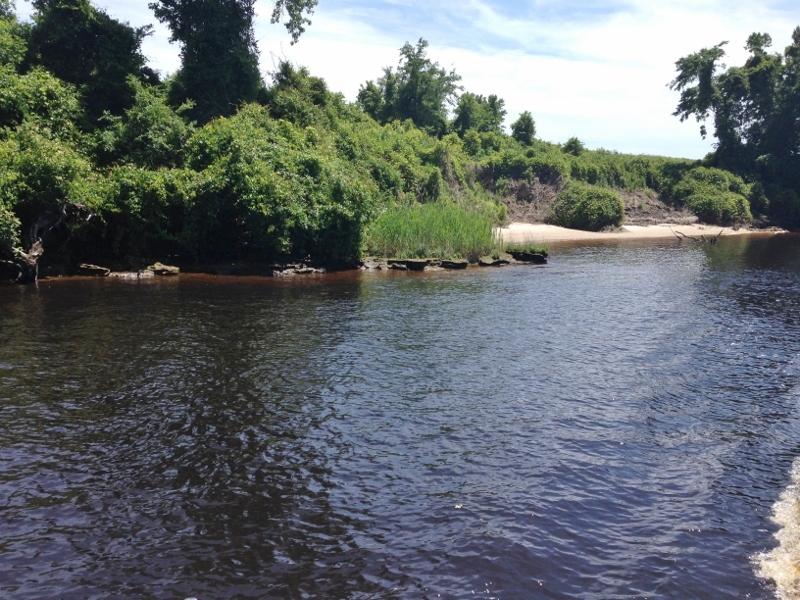 Others are an easy walk or have water taxi access but the current can be challenging and many boats try for slack. 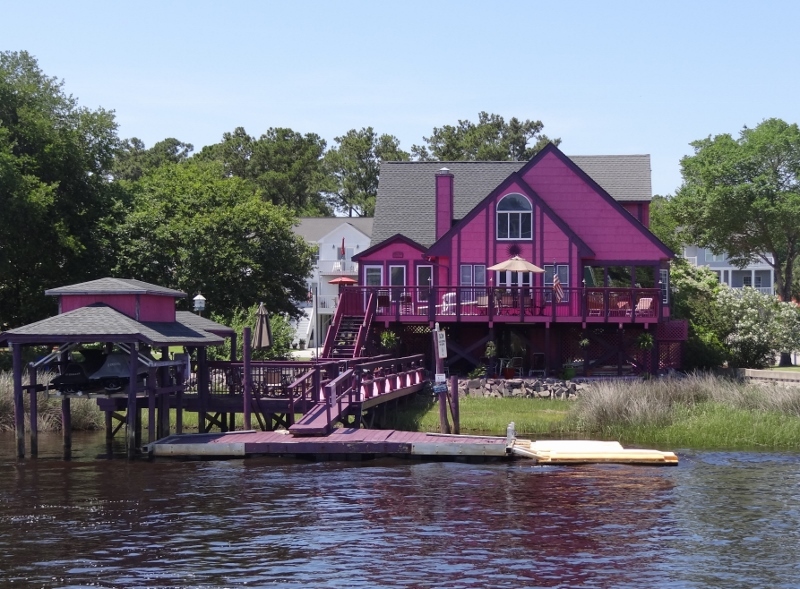 Others, like St Johns Yacht Harbor are across the way (not on the peninsula) at all, but they have one thing the others don’t; a short distance from Firefly on Wadmalaw Island and a loaner car to get you there. Two hour time limit and we used every minute of it. In our defense, certain faves, like Southern Lemonade Vodka and a new one, Grapefruit Juice Vodka are only available at the distillery. Due to no preservatives they have a shelf life and need to be kept cool and refrigerated once open. Our motto: consume quickly for maximum enjoyment! This bridge leads into the marina’s main parking lot. Been like this over a year. We knew of the collapse. Luckily a long boardwalk leads from the docks all around to a smaller parking lot across from the inaccessible main entrance. 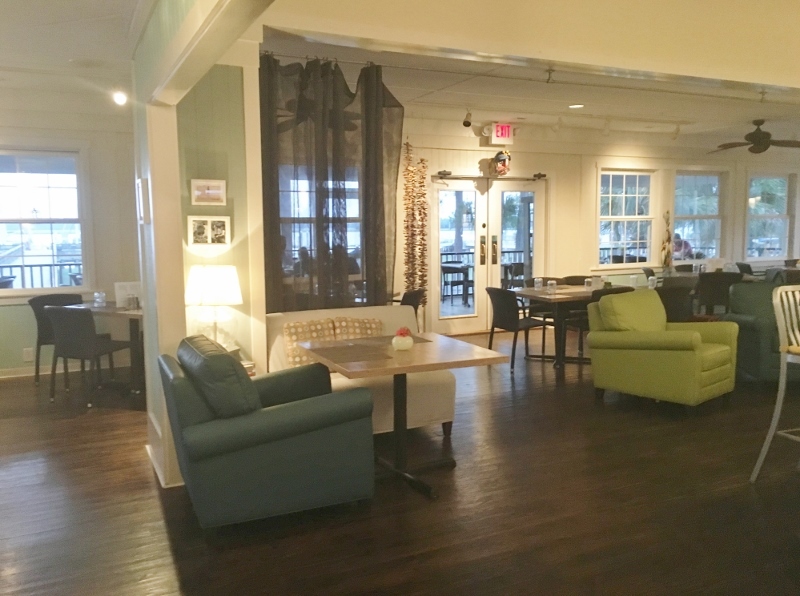 Unfortunately the on-site restaurant, the Stono Breeze, closed down when access and parking came to a screeching halt. 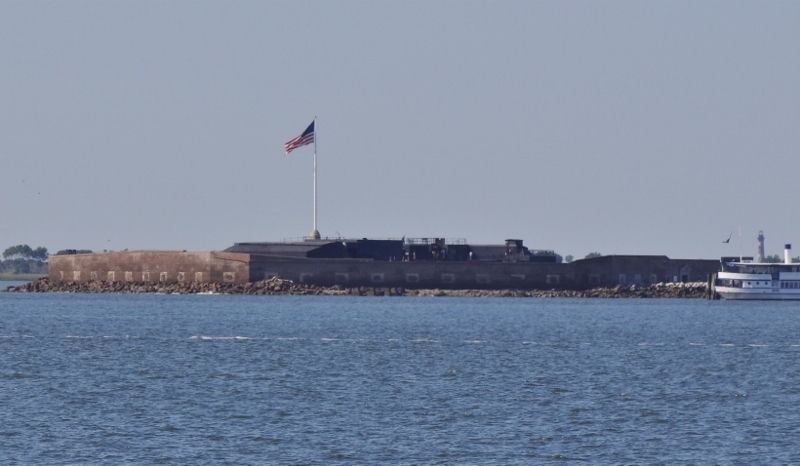 Fort Sumter. Two years ago we anchored nearby and went in for a visit. Shrimp season is OPEN! In shore begins any day now; offshore began weeks ago. 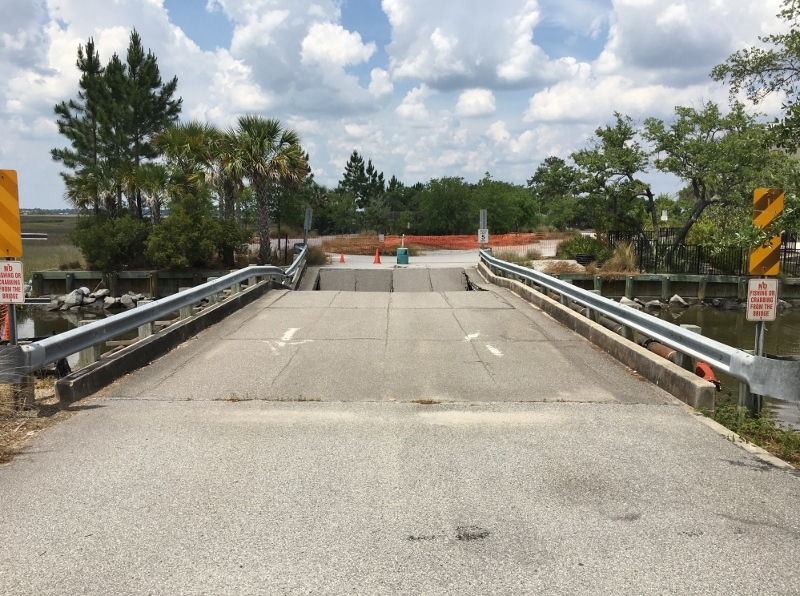 The new movable bridge across Minim Creek- fortunately it seldom needs to close. 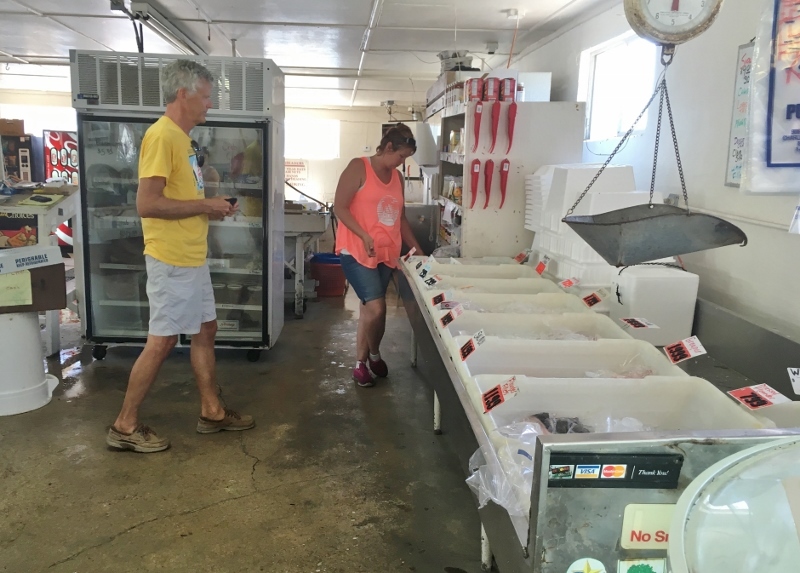 Fresh fish, frozen items, and lots of freshly caught shrimp! 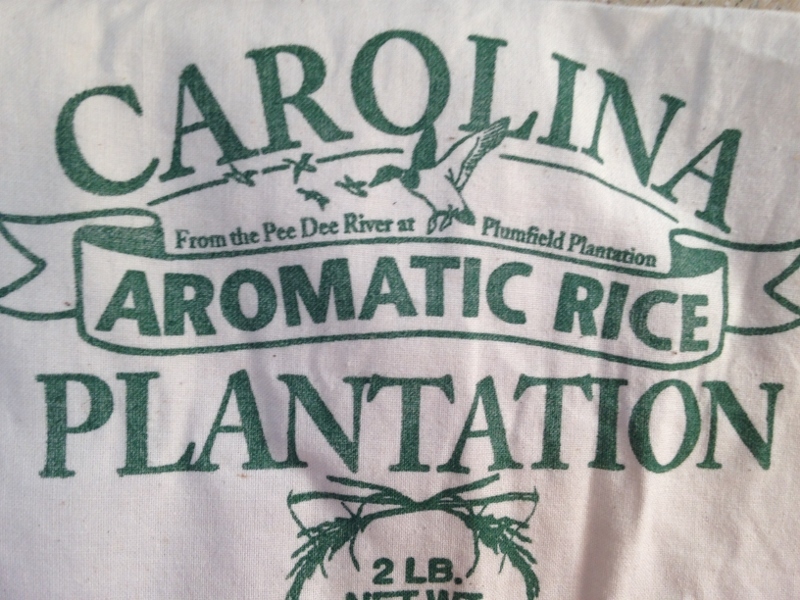 The rice we made for dinner while anchored in the Waccamaw, next to the Pee Dee River- look where it came from. You can see on the charts and as you go by, the abandoned rice fields of days long gone. 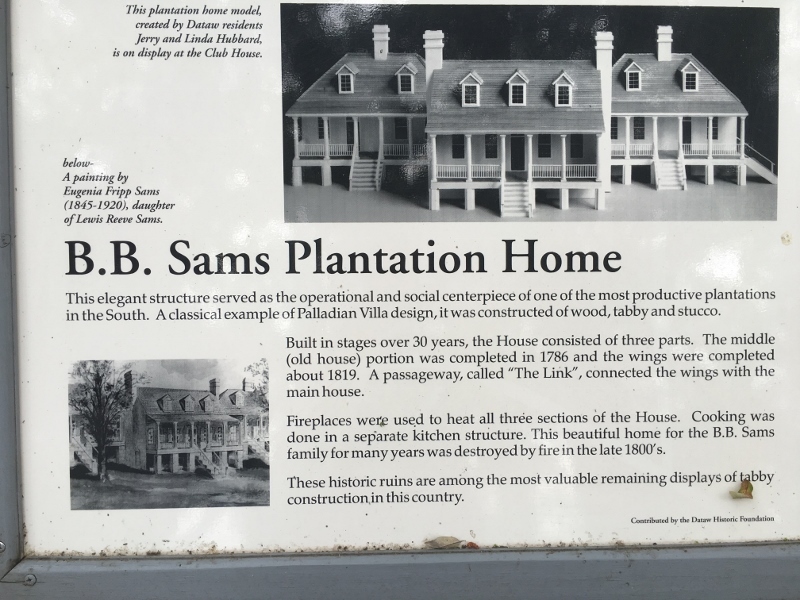 Plumfield is the only colonial plantation in the Carolinas to grow rice for commercial sale. We purchased this rice (I’m afraid to say how long ago) keep it in the freezer and it stays just as flavorful and aromatic as the first day. 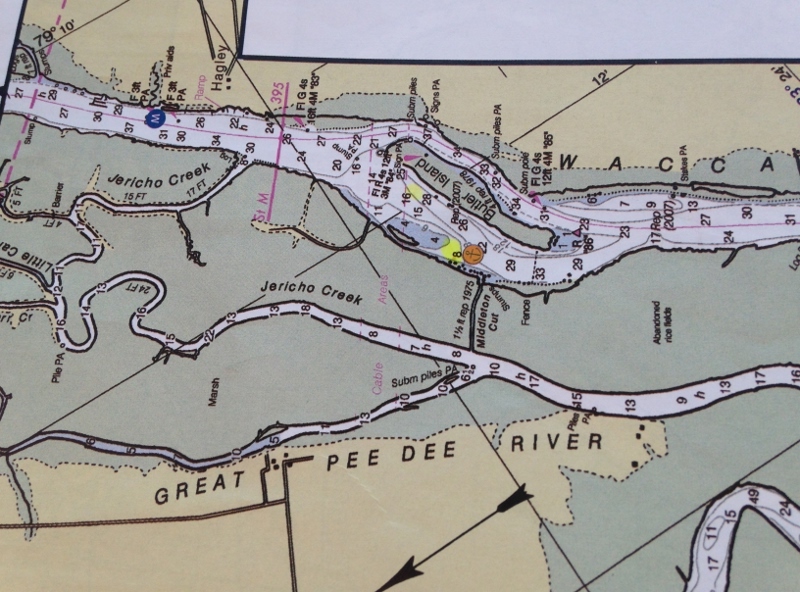 We anchored at the highlighted spot next to the orange dot. 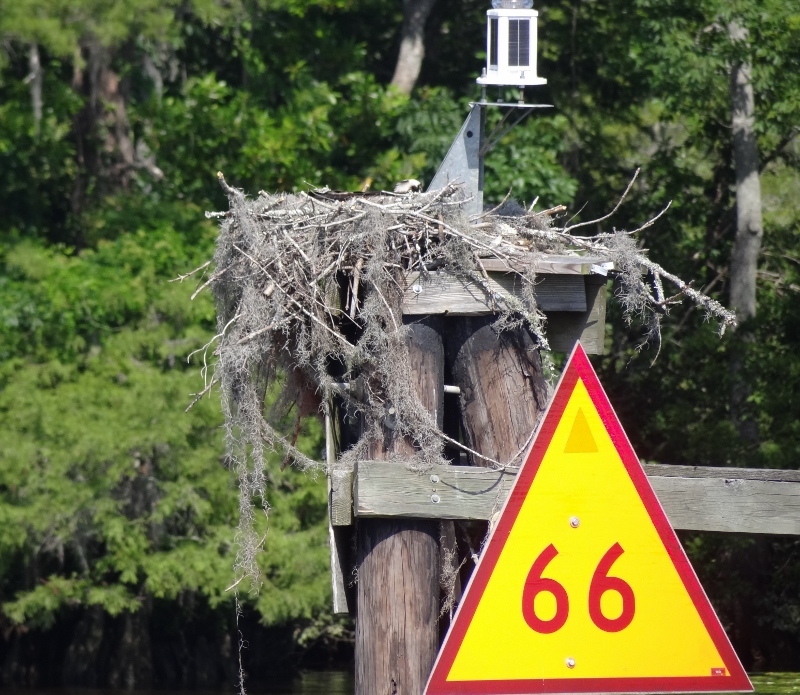 Osprey address: #66 Waccamaw River. See her head just sticking up? The white is a give-away. As I was selecting this photo for the blog, I realized it showed something odd. 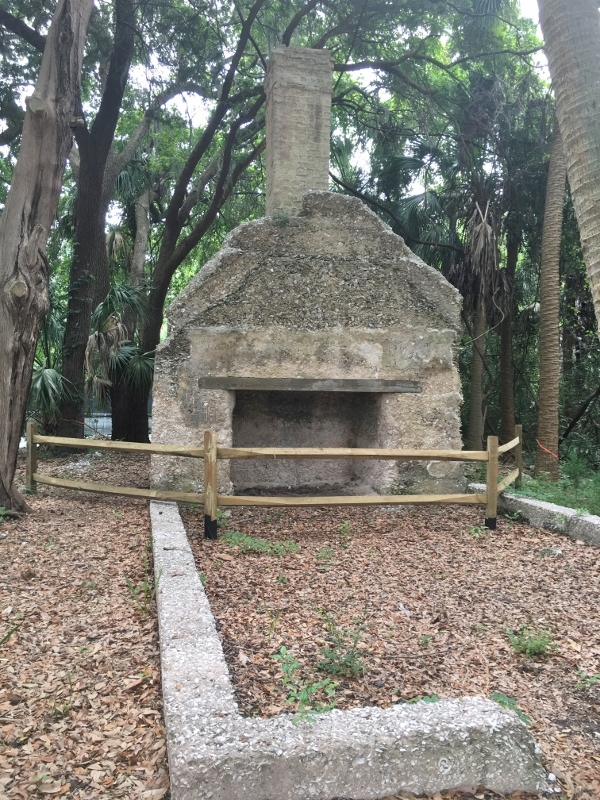 Red ATONs (aids to navigation) are red, not yellow with a red outline. So what’s going on? Testing of a new, more visible color scheme? Change happened once before (late 70s/early 80s); Russ loves to tell me that today’s odd-numbered green ATONs were once black. Can you picture that? Black- who could see them?? Even green is no prize but at least it’s a medium green. We haven’t had too many weather worries and have easily coordinated marina stops with hiding from rain and T-storms. The forecast for traveling north of Charleston (May 14-22) promised many days, not all consecutive, of rain and/or thunderstorms so we devised several itineraries for getting our donut-desiring selves to Carolina Beach by Friday (Britts only open Fri-Sun until Memorial Day). 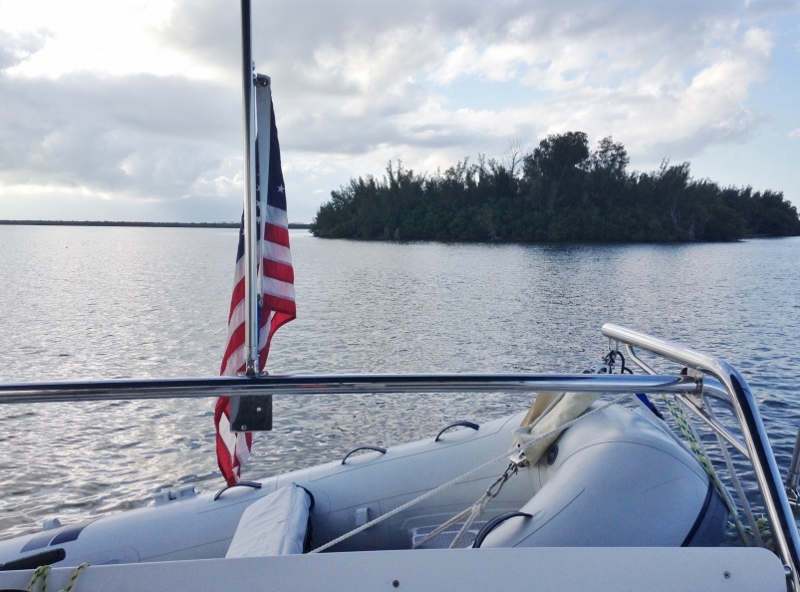 Being underway in rainy conditions with poor visibility is not our idea of fun, especially since we like to operate from the flybridge which has the bimini top but no enclosure. We also wanted fresh shrimp and cheap diesel. Oh and I didn’t want to travel between Myrtle Beach, SC and Southport, NC on a weekend day. 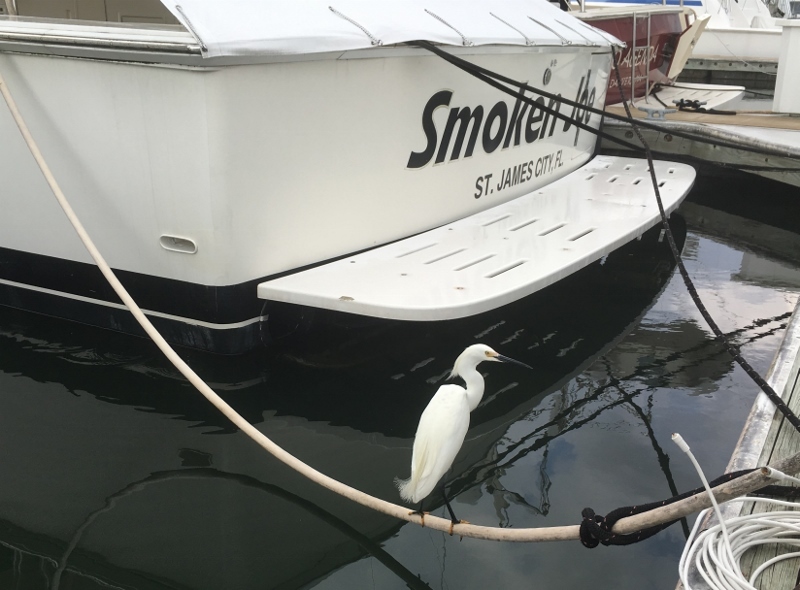 As things worked out we snagged that shrimp (surprised that no other boat was on the daytime-only free dock), made a quick stop for diesel and a pump out and did that stretch I didn’t want to do, on Sunday. 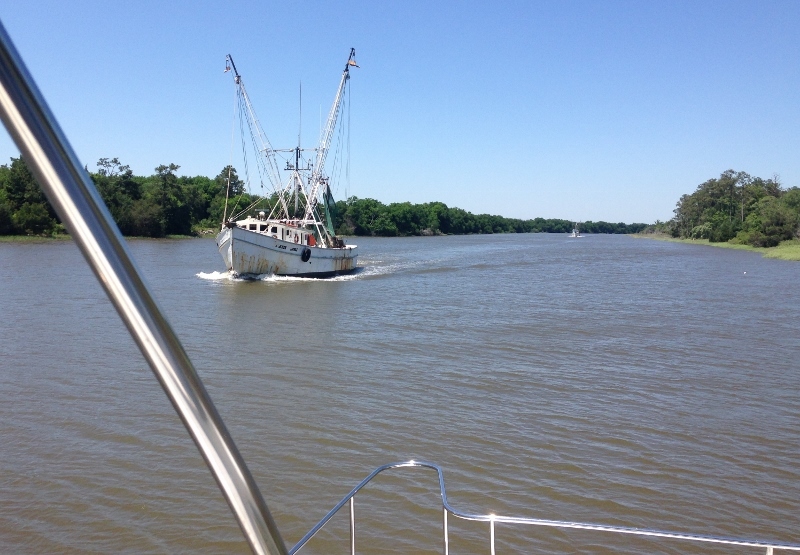 Weekend local boat traffic increases five-fold in spring and so does the need to concentrate and be watchful. 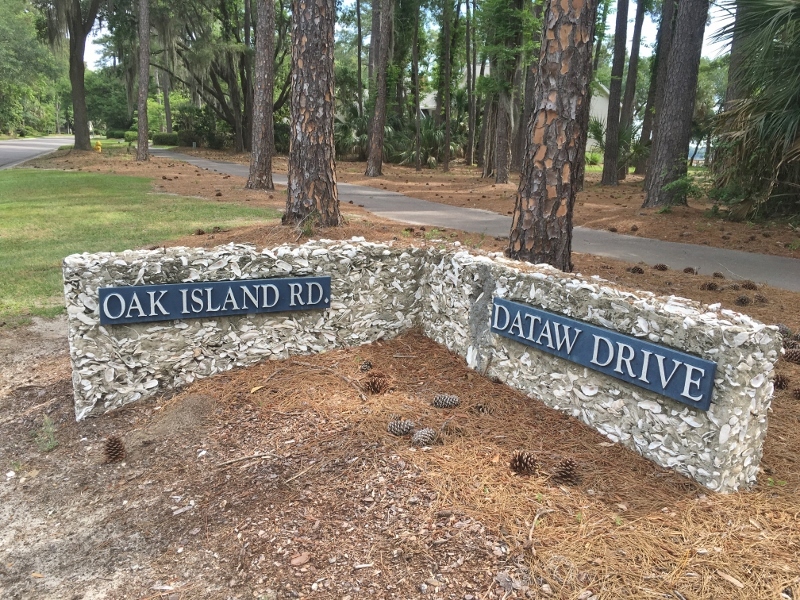 I balked at doing 84 miles that would include the narrow Rockpile stretch (North Myrtle Beach) at low water and the problematic Shallotte and Lockwoods Folly inlet crossings in North Carolina on a weekend day where we’d likely have to deal with all the small boats fishing by the inlet. 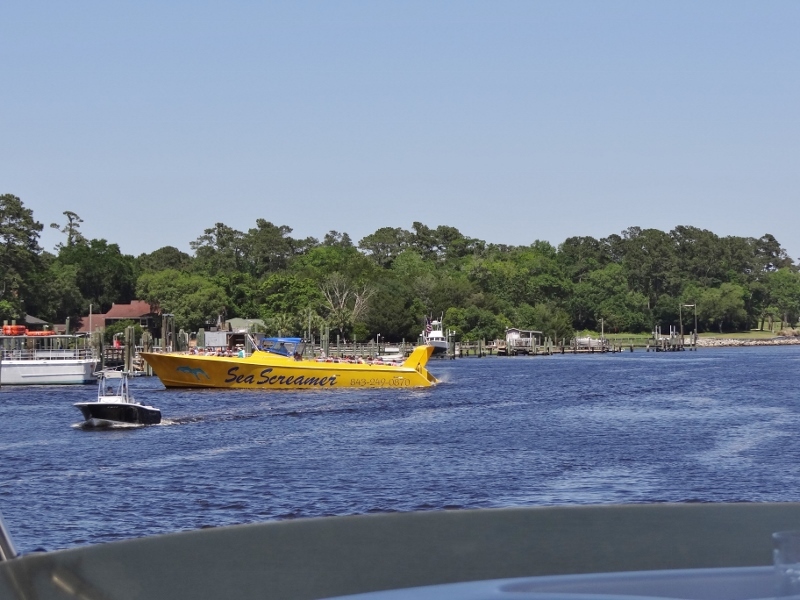 But weather and the likelihood of a good trip up the Cape Fear River the next day prevailed; with our little zoomie boat we could do it. PWC were out in force and the Captain used the horn once to alert a distracted boater, but other than a tiring day (9:30-5:15) where we moved along at 13kts when we could, nothing awful happened. Whew! The Rockpile stretch at low tide. It’s actually better to do it at low, then you can see the rocks to avoid. Hoped it wasn’t going to scream north past us, but they went south – didn’t hear any screamin’. 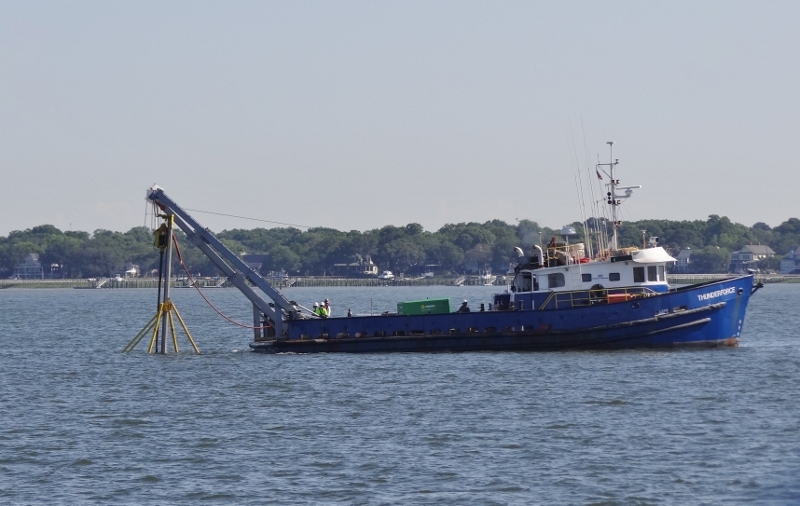 This is a close-up of the derelict fishing vessel in the above photo. Not gonna be a good Sum Day. And there you are- right at the SC / NC state line at Mile Marker 341. 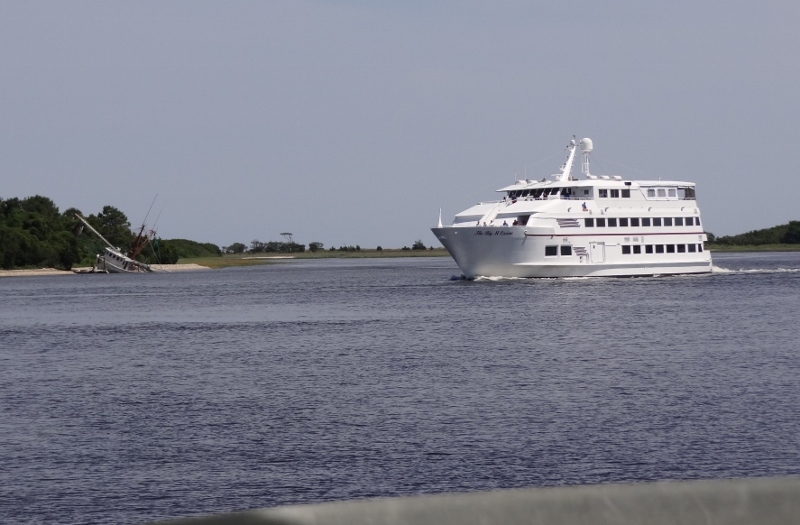 We pulled into South Harbor Village Marina (SM311) in Southport, NC ahead of schedule, but we sure gulped fuel and the gauge showed 3/4 after being extra full at Osprey SM373. On our way back from dinner we stopped to talk with the guys delivering a sportfish from FL to NJ. They’d just put over $1,500 worth of diesel in the tanks. I had to ask, “where did you start your day?” Fernandina, FL. Oh wow- gee that’s 400 miles in 10 hours. I still felt good about our 84 miles and even better about our fuel sipping compared to theirs. So what was the cause of the high fuel pressure? clogged fuel filter?